International Relations have rarely been considered a synthesis of humanistic and social sciences approaches to understand the complex connections of a global, and globalizing, world. One of the few scholars to have accomplished this creative blend was Hayward R.
Alker. 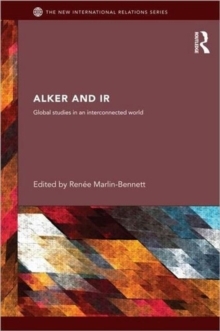 Alker and IR presents a set of visionary and original essays from scholars who have been profoundly influenced by Alker's approach to global studies. They build on the foundation he laid, demonstrating the practicality and usefulness of ethically grounded, theoretically informed and interdisciplinary research for producing knowledge. They show how substantive boundaries can be crossed and methodological rules rewritten in the search for a deeper, more contextualized approach to global politics. This book will be of interest to researchers and students of international relations and global politics.